This was by far the most rewarding, fulfilling, and life-changing experience ever! I came with my husband and his whole family and we had the opportunity to bond like never before. Paul, Marco, porters and all staff we exceptional: SO supportive, hilarious, motivating, and knowledgable. The trip was amazing first of all. Considering we demanded to do one of the most unusual, tiring and complex treks to arrive to Macchu Picchu, the service was excellent. In these 6 days we had a lot of experiences, from vomiting multiple times on the first day, to getting at the top of a mountain of 5000 meters tired as hell. This 6 days with Lizandro and all the inca Trail Reservations team were amazing. We started in molepata did the incachurasca Pass which was pretty hard. The team helped us in every difficulty we had and was always 100% available. The Salkantay trek was a great experince!! Next to all the things that are planned (visiting a glacier lake, salkantay pass, valleys jungle, camping, etc.). The guide made us feel like a group and the cook was so good !!. Especially during lunch it was hard not to eat to much before the afternoon hike. Fue una lindisima experiencia, aunque mucho mas cansadora de lo que imaginaba. El primer tramo de caminata ya empece a sentir la falta de aire, y ni hablar de la subida al lago. De todas formas, esa vista sin duda hizo que valiera la pena. Ha sido una magnifica experiencia fundamentalmente por la calidad humana del personal a cargo durante la travesía. Tuvimos una linda experiencia en estos días especialmente gracias a nuestro guia José Luis Navarrete, quien nos ayudó en todo lo concerniente a un pequenio accidente que sufrió mi marido. Por esa razón, tuvimos que alterar el plan original y retornar a Aguas Calientes, en bus, un día antes. 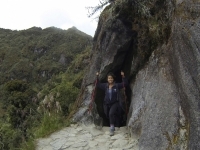 Our Inca Trail experience was unforgettable! It was a great opportunity to meet people from around the world, learn about the history of the Incans and the culture of the porters. The views were beautiful, the people were interesting and the food was delicious. I had a really time on this trip.Highlights for me include getting to the top of Salkantay. We had a great trip on the Incan Trail with Jesus as our guide. It was challenging, but the beautiful sights made all of the hard work worth it. Each day brought a new challenge and numerous breathtaking views. A Grueling Hike…and cake too! Jesus and his team did a great job helping us to conquer the Inca Trail. Jesus coached and encouraged us every step of the way, while the porters and cooks provided more practical support. Who could expect a celebration cake at 10,000 feet after 3 long days? What started out as a plan to see Machu Picchu blossomed into a plan to trek across the sacred land of the incas. eight of us set out on the trek with our willing and able guide Jesus.